Of the many things Stephanie Case has proven (about herself and the human spirit), one is that it’s possible to go from hating running so much that you count down the minutes of every workout, to being so dedicated to the sport that you’ll literally run until your pelvis breaks just so you can try to finish a race. But it was no trouble scheduling an interview, even though she was also co-editing the book UN Human Rights Council: Law, Practice and Politics in her “spare time” before starting her new position as human rights advisor for the Organization for Security and Co-operation in Europe (OSCE) in Kyrgyzstan. 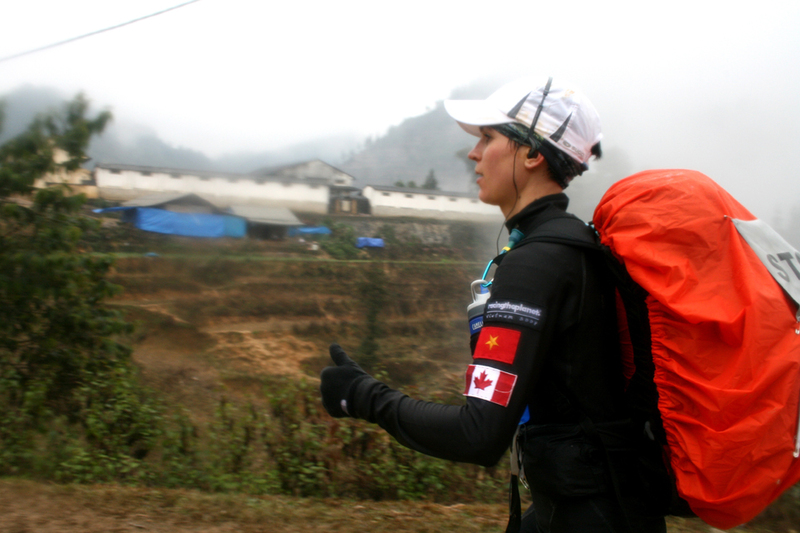 Stephanie competing in RacingThePlanet: Vietnam, 2008. Photo courtesy of RacingThePlanet. Raised largely in Oakville, Ontario, Stephanie graduated from Oakville Trafalgar High School in 2000 before returning to her hometown of Kingston, Ontario to study psychology and international development at Queen’s University. While pursuing her undergraduate degree, she also dove deeper into volunteerism. Her efforts included helping at a medical clinic and a school in Ghana, teaching English to Buddhist monks in Thailand and conducting wildlife biodiversity research in the Amazon jungle. Working with the United Nations Assistance Mission in Afghanistan (UNAMA), on a visit to the provinces, 2012. With the wheels set in motion for her humanitarian and international relations work, a new idea took root. Stephanie had always thought of herself as a “school nerd” rather than an athlete. (This in spite of having been a sailor and sailing instructor, and having competed with Queen’s University’s top varsity rowing team.) But she decided to mark the completion of her first year of law school by running her first marathon. Stephanie took up with the Leukemia & Lymphoma Society of Canada’s Team in Training (TNT) and ran the 2005 Mayor’s Marathon in Anchorage, Alaska to raise money for cancer research. It was a cause near to her heart; her biological father died of cancer when she was two years old. 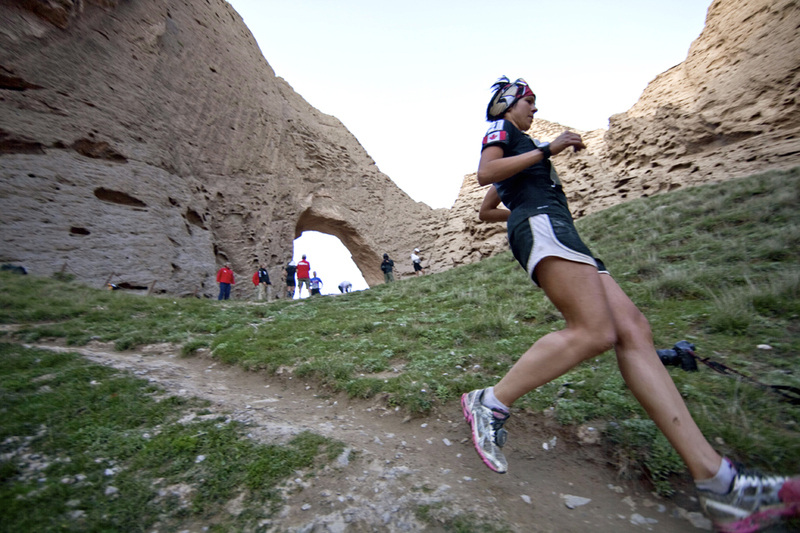 Running the Gobi March, 2012. 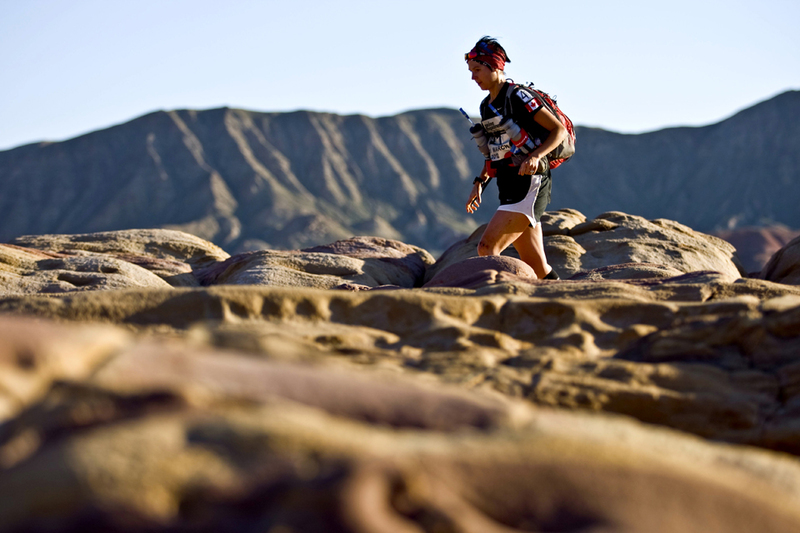 Photo by Zandy Mangold, courtesy of RacingThePlanet. In the short term, though, there was law school and humanitarian work to focus on. Stephanie had no trouble keeping both in her sights. At UBC, she was a Blakes Scholar, Wesbrook Scholar and BLG Research Fellow. During her summer breaks, she took placements that enabled her to do pro bono work with Lawyers Without Borders (LWOB), travelling to Ethiopia, Rwanda and Liberia. Then, while studying for law school finals in 2007, she got a little restless. For some of us, that might mean resorting to housework or errands as a way of procrastinating. But Stephanie doesn’t do things the way most people do. Instead, she distracted herself by climbing Mount Kilimanjaro. 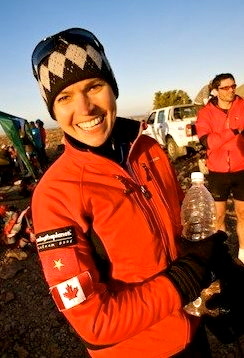 At the start of the Gobi March, 2012. Photo by Zandy Mangold, courtesy of RacingThePlanet. 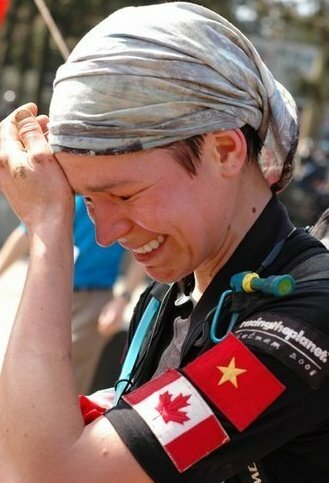 She found a way: the inaugural RacingThePlanet roving race, a 250km self-supported run through Vietnam scheduled for February 2008. “This, to me, seemed like the adventure of a lifetime, something I really wasn’t sure I would be able to finish,” says Stephanie. After trying in vain to convince some friends to join her, she finally signed up solo at 3am after a night that involved “a few too many glasses of wine.” When she woke the next morning, she had buyer’s remorse. “But, you know, once you’re committed, you’re committed,” she says. Those were her pre-Ray Zahab days, and Stephanie says she had no idea what she was doing. The wrong shoes, improper technique and overtraining soon led to a bad case of patella femoral syndrome, forcing her to spend much of her training time—not to mention the money she was making as a law clerk—on physiotherapy. To make matters more challenging, the race organizers had to re-jig the course shortly before the event because of mudslides, making the longest running day the first rather than the last. That meant 110km straight out of the block. Running RacingThePlanet: Vietnam, 2008. Photo courtesy of RacingThePlanet. As she ran through the very muddy terrain, she made it past the 40km mark. And then the 50km mark. By the time she hit 60km, and then 70km, Stephanie realized that her legs felt better than they had several kilometres back. But it wasn’t until she was about 10km from the finish that she discovered just how well she was doing. It was then that Stephanie realized she was not only capable of running ultramarathons, she was born to run them. After winning RacingThePlanet: Vietnam, 2008. Photo courtesy of RacingThePlanet. From that point on, Stephanie started pursuing ultrarunning with the same passion and fervour she has always put into her humanitarian work. Her plan: Sign up for a race, then find a way to use vacation time to train and compete. Simple as that! Swimming during part of RacingThePlanet: Australia, 2010. Photo by Chris Lusher, courtesy of RacingThePlanet. Even with Ray’s expert advice, Stephanie still faced some residual growing pains from her self-training days. 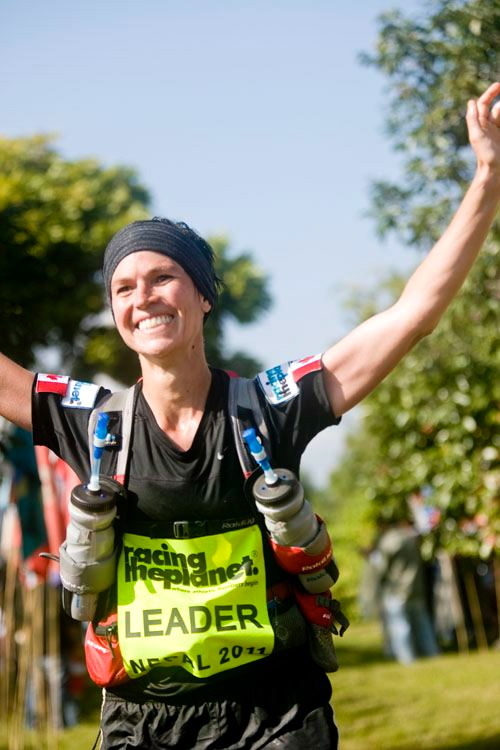 The 2008 RacingThePlanet run left her with a pelvis that was “way out of line,” and she felt the full burden of that injury in early January 2009, when a 50km training race for RacingThePlanet: Namibia left her with a broken pelvis. 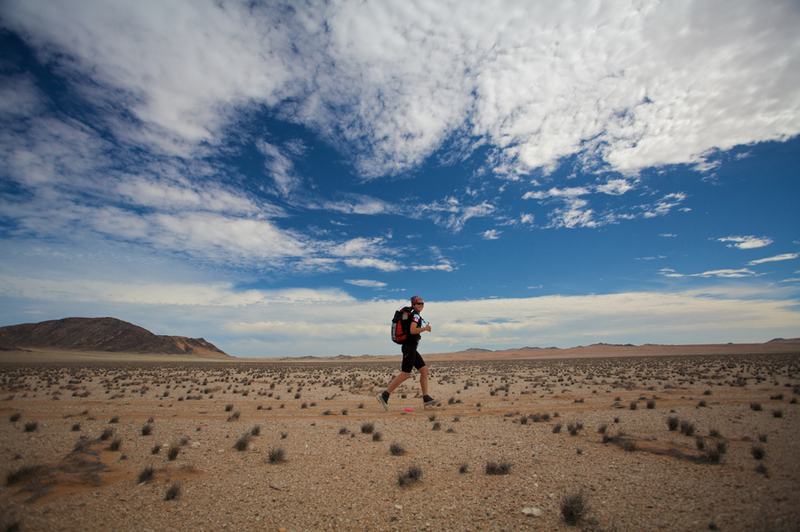 One of many happy moments during RacingThePlanet: Namibia, 2009. Photo courtesy of RacingThePlanet. Life has continued to be pretty non-stop for Stephanie. Since 2009, she has worked for the International Bar Association’s Human Rights Institute in London, England, as a United Nations and Human Rights Officer for a diplomatic advisory group in New York City, and for the United Nations Assistance Mission in Afghanistan (UNAMA). She also managed to pick up a Master of Laws degree in International Human Rights and Humanitarian Law from the University of Essex in 2011, on full British Chevening scholarship. Stephanie’s running, which she continues to use “to raise awareness for causes that might not otherwise get awareness,” hasn’t slowed down a bit, either. She’s competed in all but one RacingThePlanet roving event, finishing each time as first or second female (except for the 2009 Namibia race). 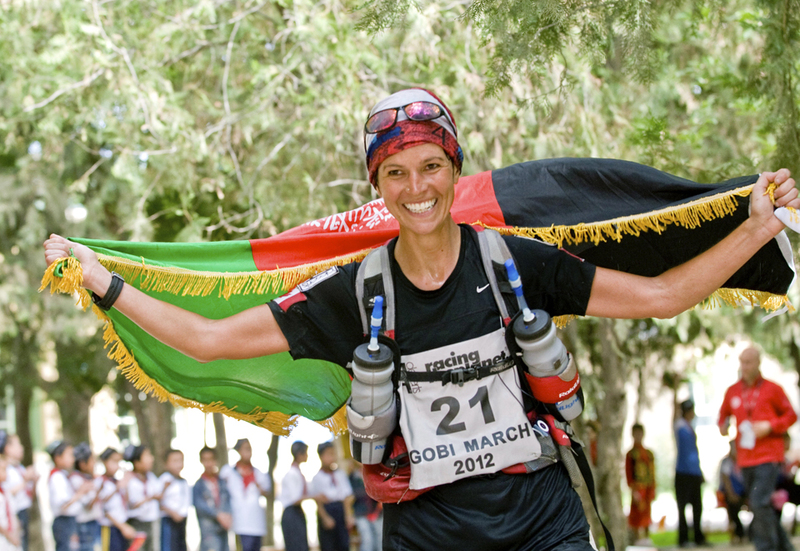 For the most recent RacingThePlanet event, the Gobi March in 2012, Stephanie was able to incorporate her interest in women’s rights into her work with UNAMA, using the race as a platform to raise $10,000 for Women for Afghan Women (WAW). The effort earned her a personal letter of commendation from the Special Representative of the UN Secretary-General. 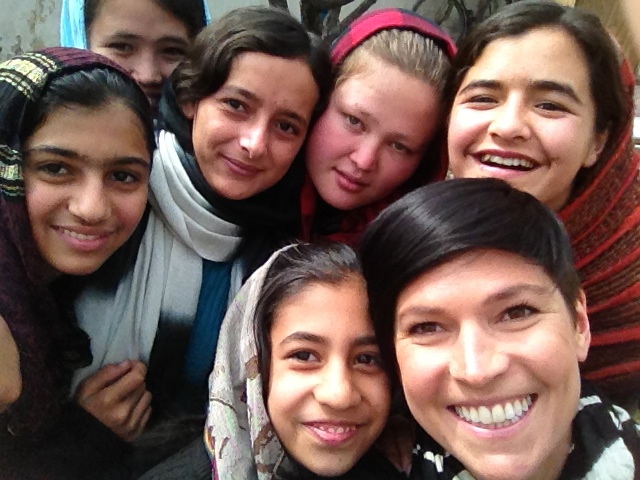 Stephanie with some of the girls she volunteered to teach on weekends during her post in Afghanistan. The girls were orphaned, or otherwise affected by war. Kabul, 2012. 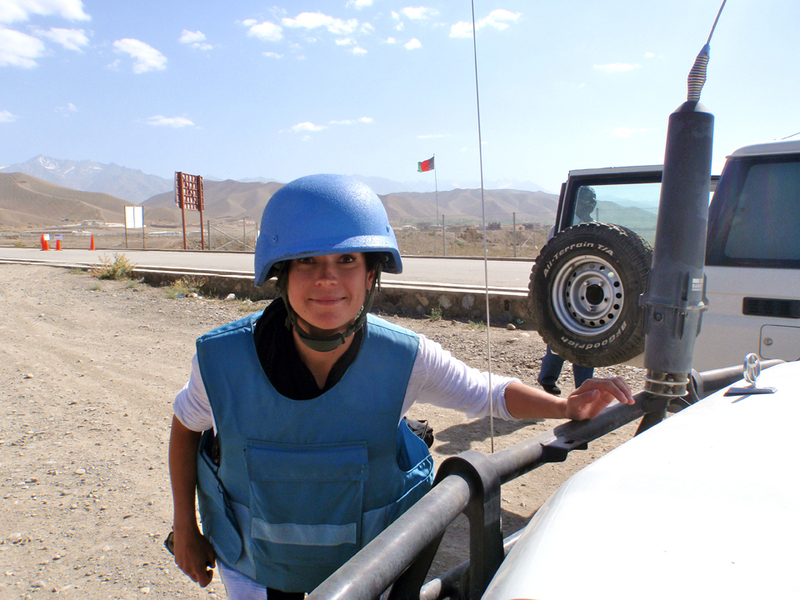 Now, less than two months after returning home from Afghanistan, Stephanie is gearing up for her next role, as a human rights advisor with the Organization for Security and Co-operation in Europe (OSCE). She’s heading to Kyrgyzstan to work on a police reform project that was started in the wake of inter-ethnic clashes in the south of the country in 2010. It’s amazing that it’s taken this long, but Stephanie says she’s starting to feel the effects of her demanding schedule. After all, she used the R&R earned in Afghanistan for what she calls R&R&R—rest, recuperation and running. That’s why she has “only” one race on her current schedule: the Ultra-Trail du Mont-Blanc® (UTMB) in August 2013, a 100-mile non-stop race through France, Italy and Switzerland. After her Kyrgyzstan posting ends later this year, Stephanie is looking forward to living a “normal” life for a bit. She wants to reconnect with family and friends, and she doesn’t think that has to interfere with her ability to do the things she loves. At the end of the day, Stephanie knows she can still answer her calling without travelling quite as much. What matters most to her is being able to serve others and make them happy. And, of course, being able to run. That’s the best way she knows to get where she wants to go. 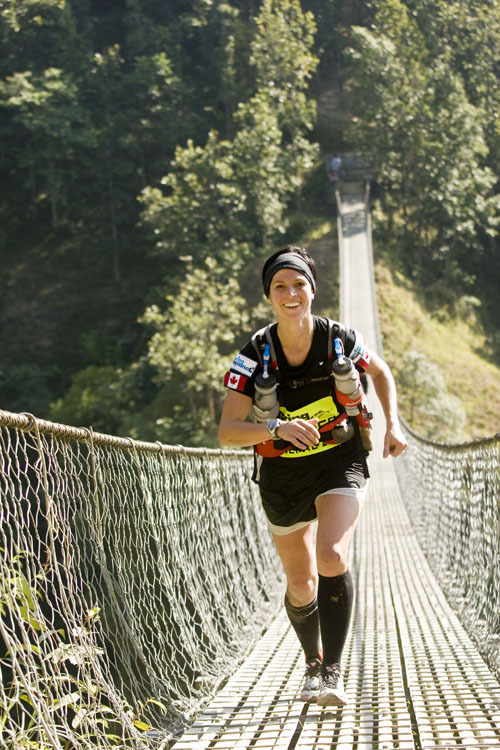 “The confidence I’ve gained from running that first 250km race in Vietnam has translated to everything else I do with my life—to my work and how I interact with people,” says Stephanie. “It was this incredible challenge I took on, and then I did it, and that was a lesson that carried on to other things. It taught me that I shouldn’t doubt myself so much at work and in personal relationships. Winning RacingThePlanet: Nepal in 2011. Photo by Zandy Mangold, courtesy of RacingThePlanet. For the latest on Stephanie, visit ultrarunnergirl.com, follow @runningcase on Twitter, check out her LinkedIn and YouTube accounts, or email stephanie@freetorunorg. You can also check out Stephanie’s nonprofit NGO, Free to Run, which she launched in 2014, and which you can follow @FreeToRunNGO on Twitter. Wow! Another outstanding inspirational life story; makes me proud of Canadians and the human spirit. Keep ’em coming Amanda, and thank you. I knew she was special when she was a student of mine and she has gone on to prove it! Way to go, Stephanie. I knew your passion for doing the right thing would ensure success in whatever you chose to pursue.